These easy chicken crescent rolls make a great accompaniment to soup as well as a snack food for any casual party or potluck. If you love Mexican food you’ll love this recipe twist on creamy chile chicken enchiladas! Super fast when you start with refrigerated crescent rolls and a rotisserie chicken. If you are in a hurry click here to go straight to the creamy chicken crescent rolls recipe. 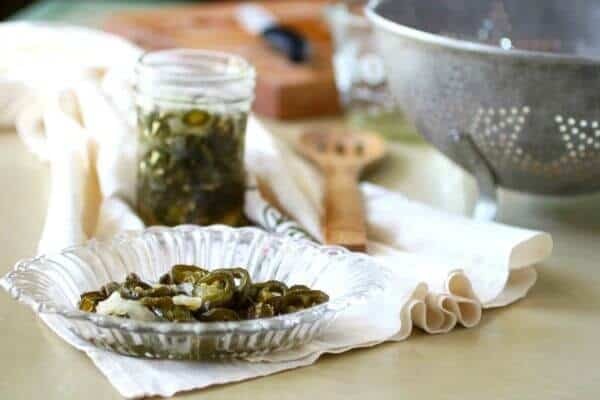 This recipe is SO incredibly easy! It’s one of those finger foods that everyone loves! These chicken crescent rolls are as welcome at a church potluck as they are sitting next to a bowl of steaming hot soup. If you start with chicken that’s already cooked and refrigerated crescent rolls you’ll be taking your first, spicy-creamy bite within 30 minutes or so! I’d suggest making extra. One of the biggest lessons that I’ve learned over the years is that it’s not a sin to make things easy where you can. My mom was a stickler for being busy all the time. Idle hands are the devil’s workshop, doncha know? She considered hiring household help to be the very pinnacle of laziness. Don’t get me wrong, we were quite well off — Dad made a good living in an upper-management, executive position. It’s just that they had both been teens through the Depression and it left Mom kind of afraid to relax. Being busy meant you were accomplishing things, taking care of things, and maybe it even gave you more value. As a result I grew up with the idea that life should be hard work. You know, make every single thing from scratch, grow your own produce, spend hours canning… it didn’t help that my ex-husband was… hmmm… financially challenged. So over the years I somehow decided, deep in my psyche, that the harder I worked the more people would love and respect me. So very wrong! Personally I am glad that I am at the point in my life when running to Wal-mart for a rotisserie chicken or a birthday cake (because I just couldn’t fit it in the schedule without staying up all night) makes me thankful that there’s one just 1/4 mile down the street. I don’t have to do it all – and it doesn’t make me a better person if I do. Just a more exhausted one. I am finally learning to relax. I cook a lot of our food from scratch but sometimes it’s nice to use convenience foods… like in this recipe. If you love creamy chicken enchiladas (I know I do!) you’ll love these. 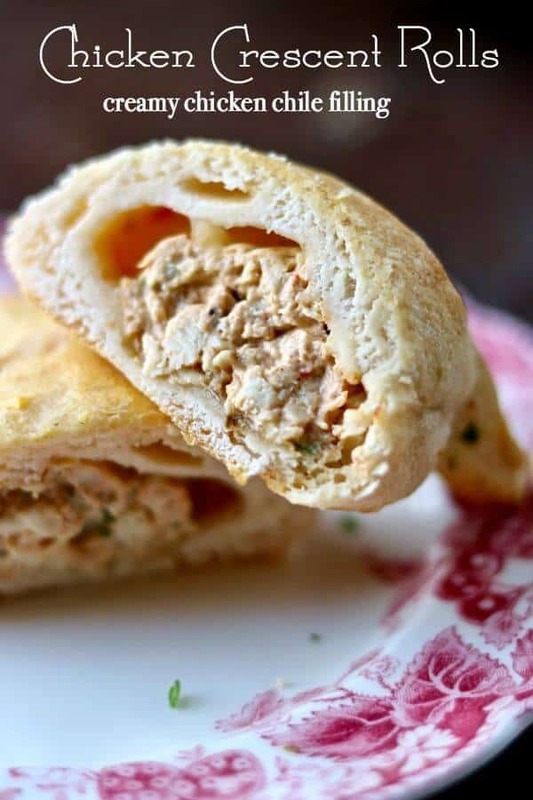 Shredded or finely chopped chicken is mixed with cream cheese and chiles then rolled up in a crescent roll with a slice of Pepper-Jack cheese. It’s all creamy, gooey, cheesy, spicy perfection. Pretty sure you’re going to love these. I love my silicone baking mats! They keep things from sticking and help my baking sheets last longer. And… if you’re in the market for new baking sheets these are heavy duty commercial grade and they will last forever! Here’s the creamy chicken crescent rolls recipe. You can now change the serving sizes on recipes. Just hover over the serving size and adjust it up or down. The recipe will automatically adjust. Cool, huh? 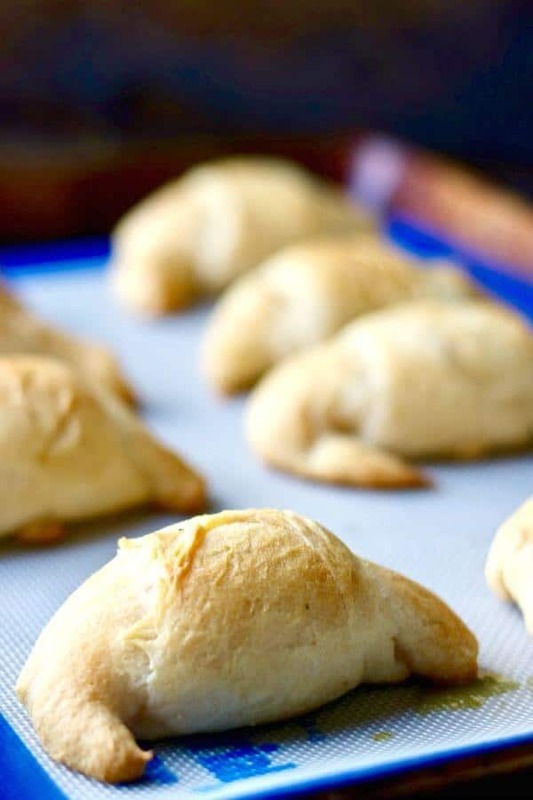 Easy snacks or side for soup, these creamy chicken crescent rolls go together fast. Tender crescent rolls hold a southwestern style filling of chicken, cream cheese, cilantro, chiles, and Pepper-Jack cheese. Mix the chicken, cream cheese, chiles, cilantro, and cumin. Open the can of crescent rolls and separate the dough into 8 pieces according to the instructions on the package. Lay a triangle of the Pepper-Jack cheese on each flat crescent roll. Add a heaping tablespoon of the chicken mixture. Roll up and bake according to instructions on the package - usually 350 for 10 to 15 minutes. Refrigerate leftovers. These may be frozen. I should try this one, its looks delicious!